Pat Chicken dry, Place flour in bowl and add 1 T Kosher Salt and 1/2 T black pepper. In another bowl beat the 2 eggs, and in another bowl mix the bread crumbs, parmesan cheese and parsley. Dredge chicken in seasoned flour, then coat with egg on all sides, place in bread crumbs and be sure to cover evenly. Pre-heat oven to 375 degrees, in a saute pan over medium- high heat melt 1 T butter and 1 T oil. Gently place chicken in pan and lightly brown on one side, turn over and brown lightly on this side as well. Remove from pan and place on a lightly sprayed sheet pan or cookie sheet, and place in oven for 10-13 minutes until done. 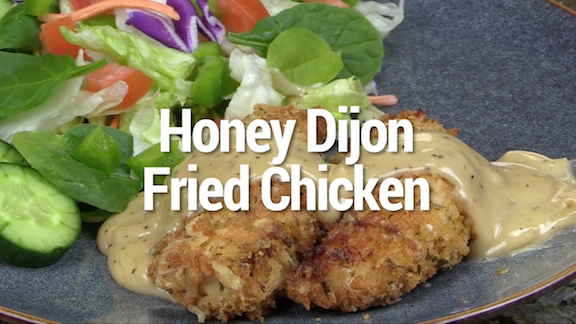 Honey-Dijon Cream Sauce: Reduce cream by 1/3 over medium heat, whisk in honey and mustard, season to taste. This is also served great with Marinara sauce, roasted garlic cream sauce, or Alfredo sauce.